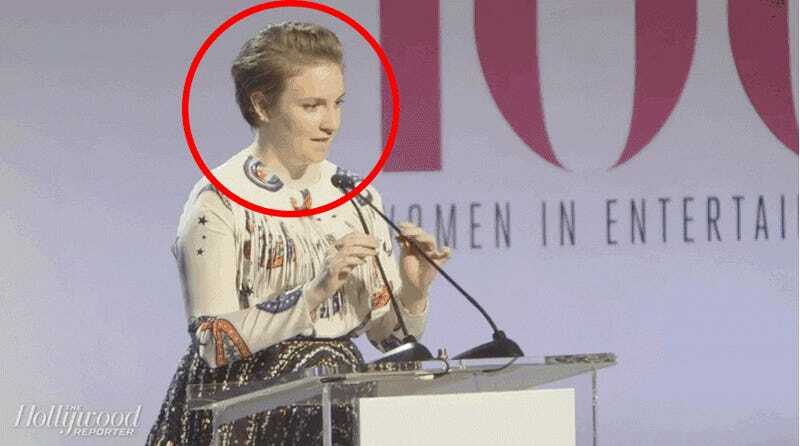 How Did Lena Dunham Watch Lena Dunham Give a Speech? Speaking at the Hollywood Reporter’s 2015 Women in Entertainment breakfast, actor/writer/director Lena Dunham kicked things off with a joke, saying, “I am seated near Kris Jenner. It doesn’t have to be a big deal for you, but it is for me.” The camera then cut to the crowd—a crowd that mysteriously included Dunham herself—laughing uproariously. It’s a powerful call to arms. Also powerful: The ability to exist in two places at once. We’ve reached out to THR for comment and will update if they get back to us. Thanks for catching the mistake. Our editor was working quickly at our event and pulled from the wrong B-roll. It has been updated. Or Lena Dunham is actually two people! You decide! Video and Images via The Hollywood Reporter.